Drawn from the Collection of Marie Brenner & Ernest Pomerantz, the photographs capture pivotal moments and people of the 20thCentury. More than 70 of these Works Will Go on View at the Museum in February 2019. 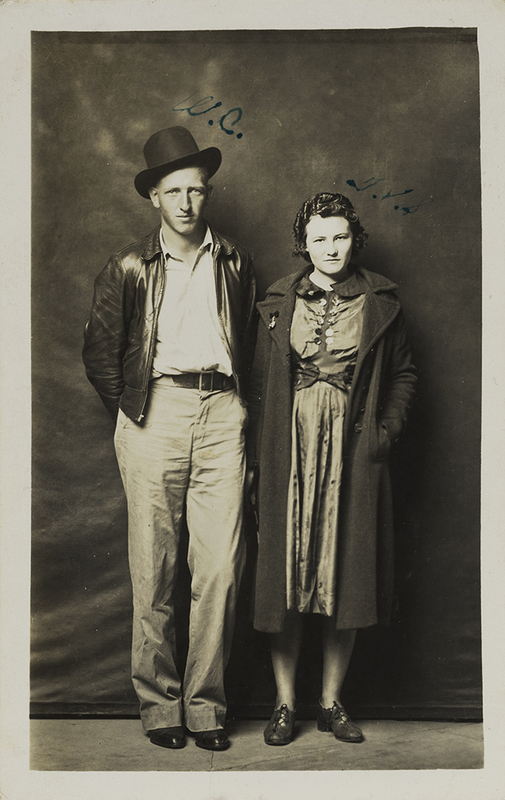 The San Antonio Museum of Art has been given more than 850 photographs by collectors Marie Brenner and Ernest Pomerantz. The works, which begin in the 1920s and run into the 1990s, track transformative events such as The Great Depression, World War II, and the Civil Rights Movement, as well as scenes of urban and rural life, such as the marqueed chaos of Times Square or the gnarled trees of the Sierra Mountains. To celebrate this gift, the Museum—which has been steadily growing its photography collection over the last three years—will present the exhibition Capturing the Moment: Photographs from the Marie Brenner and Ernest Pomerantz Collection, opening February 22 and running through May 12, 2019. Among the artists whose work is included in the gift and the exhibition are Dmitri Baltermants, Ilse Bing, Paul Caponigro, Henri Cartier-Bresson, W.E. Dassonville, Mike Disfarmer, Leonard Freed, Danny Lyon, Joel Meyerowitz, Arthur Rothstein, Stephen Shore, and Louis Clyde Stoumen. The work of many of these photographers was informed by changes in camera technology, such as the introduction in 1924 of the lightweight Leica 35mm camera. These very portable cameras made it possible for photographers to enter any landscape and document events—capturing what the photographer Henri Cartier-Bresson termed the “decisive moment,” that split second that reveals a subject’s larger truth. Capturing the Moment features more than 70, primarily black-and-white photographs drawn from the Brenner and Pomerantz gift, as well as a selection of films. The exhibition will be divided into three sections: people; war and conflict; and landscapes, both rural and urban. Within each area, the show will explore the development and application of different styles and approaches—from documentary photography and photojournalism to street photography—and highlight the technological advance, socio-political upheavals, and cultural influences that spurred the era’s artistic innovation. 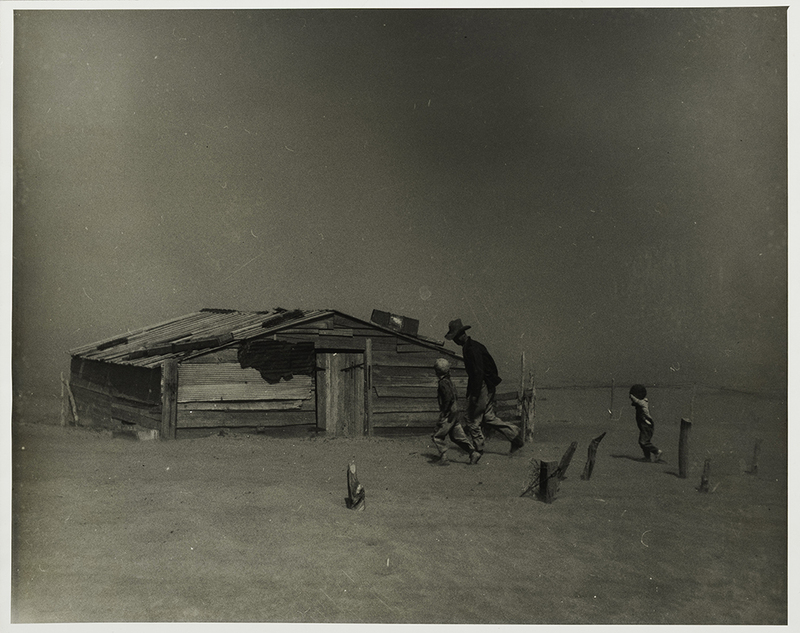 For example, Arthur Rothstein’s photo Dust Storm, Cimarron County, Oklahoma, 1936, vividly captures what must have been the terrifyingly common occurrence of seeing one’s house nearly buried in the American Dust Bowl, as a young boy and a man appear to make their way towards the door of a ramshackle wooden home. 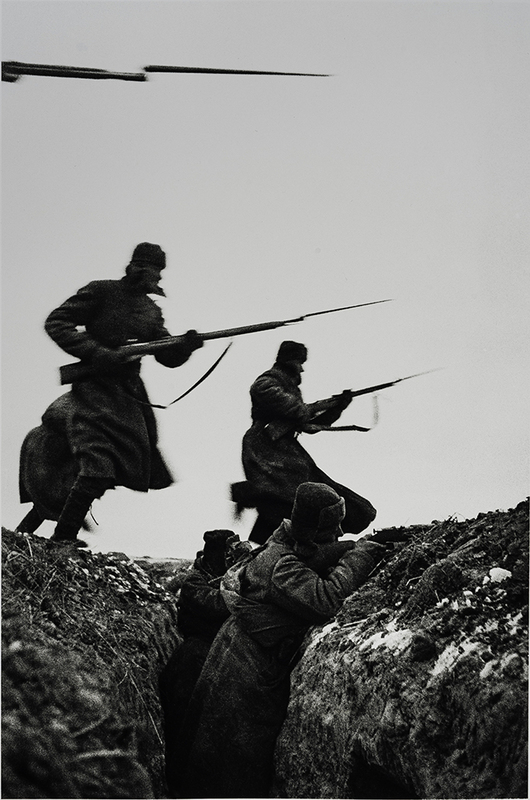 A similar sense of action, fear, and strange normalcy comes through in Dmitri Baltermants’s war photo, Bayonet Attack, November 1941, in which the front of a rifle and its attached bayonet pierce the foreground in the upper part of the image, while several other armed soldiers are poised to shoot. Stillness—or the appearance of stillness amidst chaos—is also found throughout the exhibition. W.E. 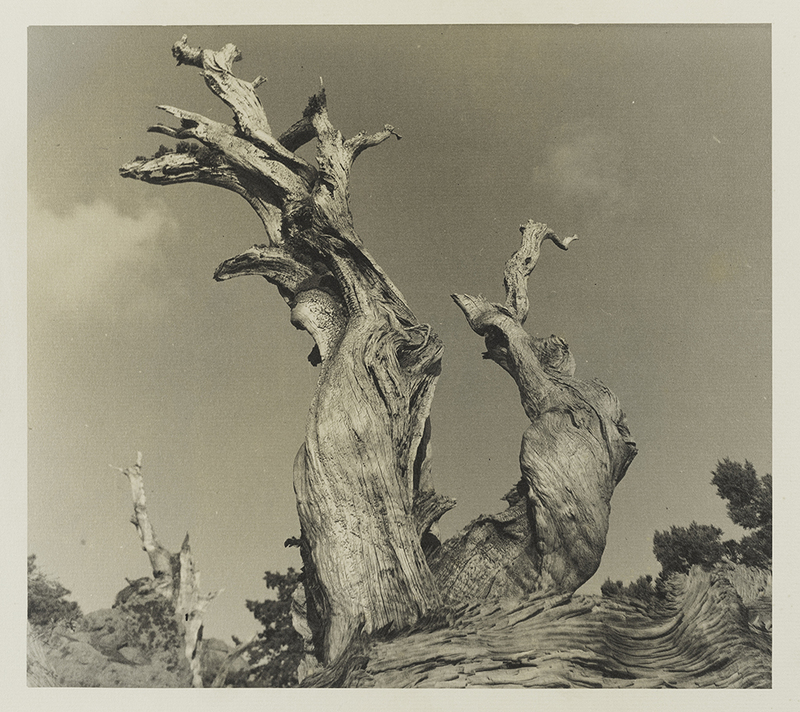 Dassonville’s 1930s photo Gnarled Trees, High Sierras gives a clear impression of the power and complexity of nature, with the details of twisted wood quite clearly seen, even as the overall scene is one of calm. Louis Clyde Stoumen’s photo from the early 1980s Hell Night, Times Square lends a similar effect in entirely different circumstances. Here, the movie theater marquees for Hell Night, Superman II, and Arthur, along with the other surrounding billboards, mark out space within a frame otherwise dominated by bustling pedestrians. Along with exploring aesthetic and stylistic approaches in photography, this exhibition and supplementary programming will explore important relationships between technology and photographic practices; film and photography; and connoisseurship, collecting, and preservation. Among the films that will be presented are four by artists in the exhibition: Henri Cartier-Bresson, Danny Lyon, and Henry Horenstein. The exhibition will also be complemented by lectures and workshops. 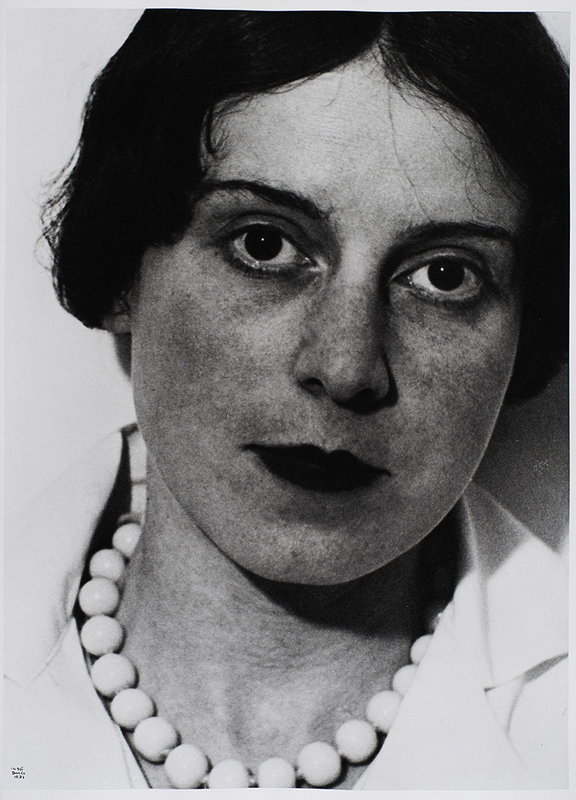 Curated by Suzanne Weaver, the Museum’s Brown Foundation Curator of Modern and Contemporary Art, with support from Assistant Curator Lana Meador, Capturing the Moment: Photographs from the Marie Brenner and Ernest Pomerantz Collection runs through May 12, 2019. The gift from Marie Brenner and Ernest Pomerantz is the third major photography gift to the San Antonio Museum of Art in the recent years. In 2017, the Museum announced that it had received 31 portraits from noted American photographer Timothy Greenfield-Sanders’s Latino List series, given by art dealer and collector Hiram Butler. 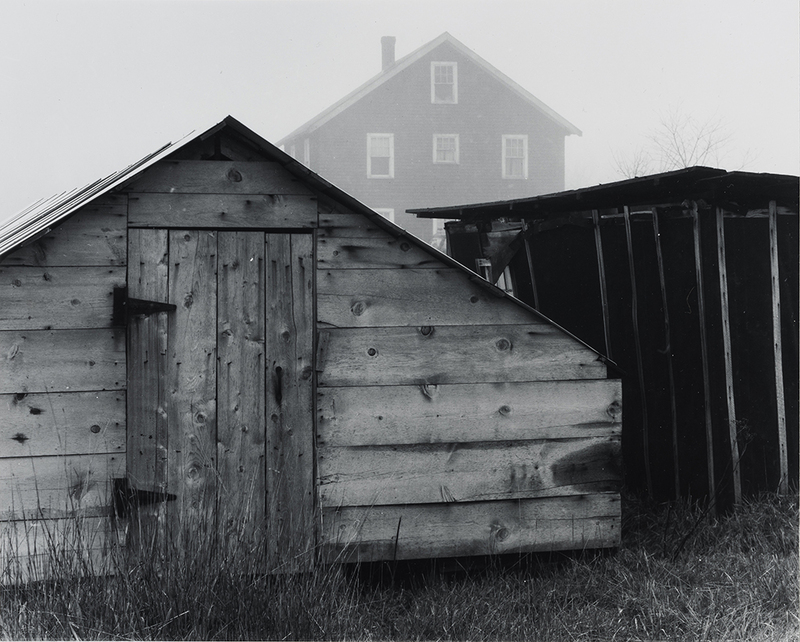 And in early 2018, philanthropist and art collector Christian Keesee donated 50 works by Brett Weston from 1940–1985.